Produce dovetail joints and three different size box joints! See Food Safe Wood Oil. After making my own jigs and always having an issue with consistent joints, this was a nice change. Easy setup, good clean joints which fit every time. Simple, but well designed. The only negative I found was I wish the platforms were longer so I could clamp them on my router table long-ways (parallel to how the fence sits). I know I can screw them down, but would rather not start making holes in my table. The description for this item says it is "for table mounted use only". I just bought the cast iron table saw extension/router table to save space. On a whim, I bought the multi-joint spacing system and found that I can secure it to the extension table very easily by using the router fence slots to put hold-down clamps in. This worked very well and I have been able to use all three sizes trouble-free. MLCS should note this and recommend the sale of hold down clamps as an additional accessory. 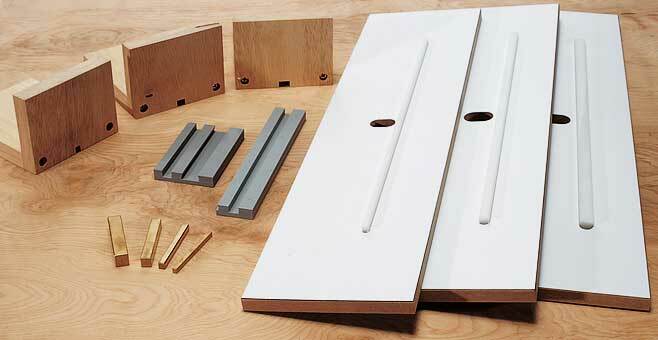 I am new to router joints and I can make perfect box joints with this set. I clamp the first two and the last pass and just hold the stock for the other cuts. It works perfect and the joints are quite tight. Just take your time getting it set up properly. Love it! I had made a jig myself and had varying results and much adjusting. 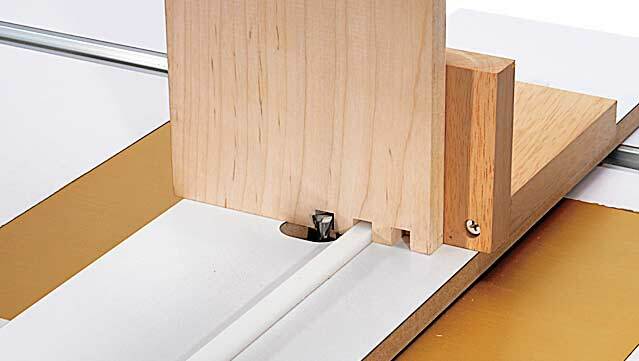 The very first time I put this system on my router table I had a perfect joint. Randy from Tx is correct about gauging the height with the stock being used, this allows for a wide range of applications. Very happy with the delivery and the packaging. As a new adventurous into box joint, joinery and after study and research I optioned for the router table version The MLCS Multi Joint System as for me swapping out a router bit is much more to my liking apposed to swapping out a tablesaw blade plus it’s easier and leaves a cleaner cut. I’ve had this system for a good while and after trial and error during the learning phase, I now have a good grasp on how it works, am pleased with how it preforms, it’s ease in use and ready to write a review on it, once I got the hang of it I’ve been making flawless joints that look very professional, the bits I use are Whiteside up-spiral bits, I’ve learned that practically all of the box joint jigs work on the same principle be it tablesaw or router table it’s just a matter of ones liking and preference be it tablesaw or router table though I have heard that a router bit leaves a cleaner cut as mentioned earlier, I believe that all jigs share the same principle in that they work or use a key and spacing system and in order to have a smooth joint the spacing has to be precise any minute fluctuation in the spacing can leave for a bad joint, 1. A gap between each pin (box joint) and slot is caused by a key (spacing) that’s too close to the bit meaning when first setting up for the cut depending on the size of your joints when spacing between the bit and the guide pin or guide bar the spacing was to close between the two, 2. If the pins (box joint) won’t fit in the slots at all, the key was setup too far away from the router bit when spacing between the guide pin or guide bar, 3. If you have an offset from the top and bottom of the box sides this is caused by not having the workpiece fully seated against the key before making the cut. Cons: The only thing that got me off track was the video, it is misleading and incorrect in a couple areas, 1st in the setup when adjusting the height, the video leads you to use the spacer brass bar, this is *WRONG* don't use the brass bar instead use the work piece that you are going to cut, by laying it flat against the bit, and leaving about a 64th or less above it, example say you are making 3/8" joints but your work piece is 5/8" thick you use the 3/8” bar and make your cut, it's going to leave you way short on both ends. 2ed in setting up, the video teaches you to pinch the brass bar between the guide rail and the bit once again that is *WRONG*, if you have the space to tight it will leave for loose joints after cutting, you want the brass bar to move freely between the guide rail and the bit but without any play, also in the video when doing the multi-board cut they fail to mention that this is only good for 1/2" 3/8" and 1/4" wide boards if you are doing 9/16 or 5/8 this method won't work. all-in-all I am very pleased with it. Carbide tipped. For sliding dovetail joint. For outside, sliding double dovetail joint. Carbide tip. Carbide tipped straight router bits. Solid carbide spiral upcut router bit.